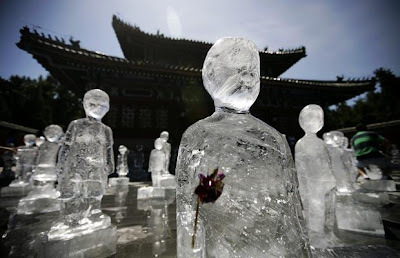 13 Above: Catastrophy Tightens Grip As 100 Children Melts !! 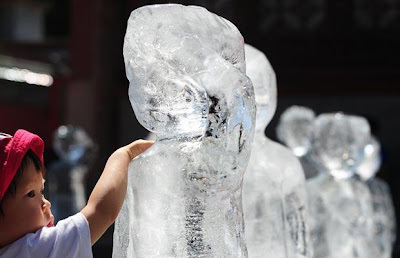 Catastrophy Tightens Grip As 100 Children Melts !! 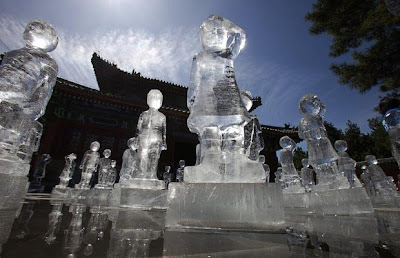 100 child-sized ice sculptures sit in Beijing’s Temple of Earth to represent the 1 billion lives that will be lost in Asia due to water shortages caused by climate change. The art installation marks the launch of the TckTckTck Campaign, a campaign that works to raise awareness of the importance of a fair and ambitious agreement at the upcoming United Nations Copenhagen Climate Summit, taking place from December 7 to 18, 2009, where world leaders will gather to establish a plan to protect the world’s population from climate change. The Temple of Earth was chosen because Chinese emperors used the temple to pray for the good harvests and the well-being of Earth. TckTckTck is a global alliance that is using an open campaign model to empower others to educate others to demand a fair agreement at the Copenhagen Climate Summit, more information can be found here. A week-long campaign will take place from September 20 to September 26, 2009 in New York City, residents can find out what is going on during Climate Week NYC here. Why 100? The United Nations Copenhagen Climate Summit — when world leaders will put together the successor to the Kyoto Treaty — happens this December, 100 days from today. 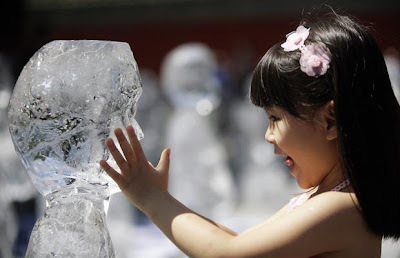 That’s why today also marks the launch of the TckTckTck campaign, which urges governments “to agree a fair, binding and ambitious deal at the Summit.” If our governments fail to set serious goals, we could be saying bye-bye to a lot more than “just” glaciers. 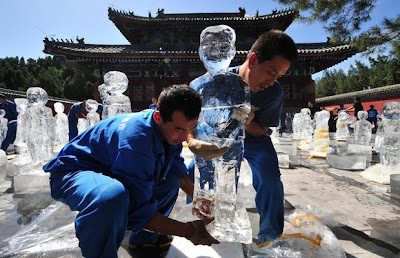 The sculptures in China were made from glacial melt water from the source of Yangtze, Yellow and Ganges rivers — and judging from the photos, didn’t last too long under the sun. 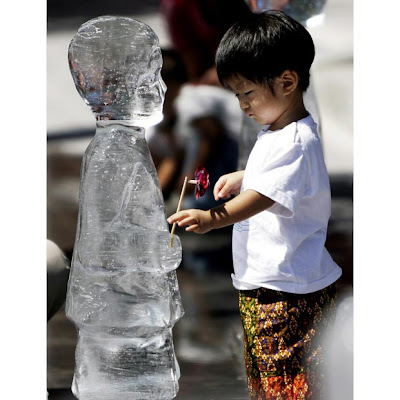 Save the glaciers from a similar fate by joining up with other TckTckTck activists. Time’s running out! 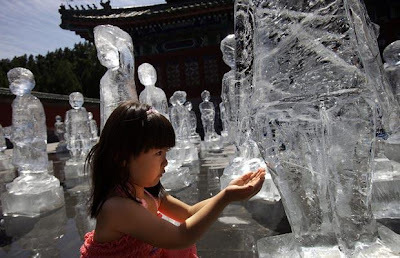 The sculptures were made from glacial melt water from the Ganges, Yangtze and Yellow rivers in Asia as a warning to the one billion people in Asia threatened by global warming. 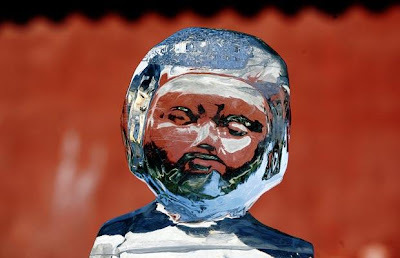 The melting Himalayan glaciers threatens the water supply of one fifth of the worlds population, say Greenpeace. 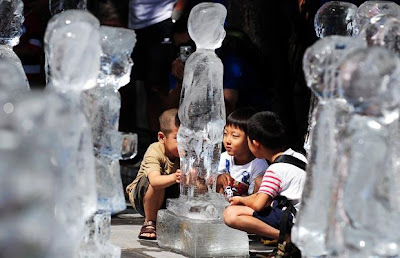 If world leaders don't agree to stop runaway climate change, children of today will grow up facing a constant struggle to secure reliable access to drinking water," said Greenpeace China Climate and Energy Campaign Manager Yang Ailun. 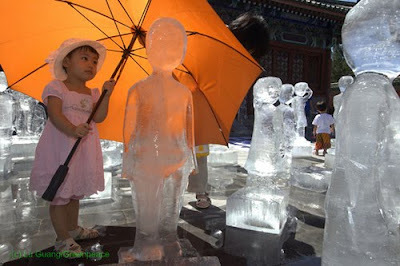 "The future prosperity of India and China is literally melting away," Yang Ailun added. "With only 100 days to go before the Copenhagen Climate Summit, leaders around the world must take personal responsibility for averting climate chaos and stop the greatest threat to all of humanity." 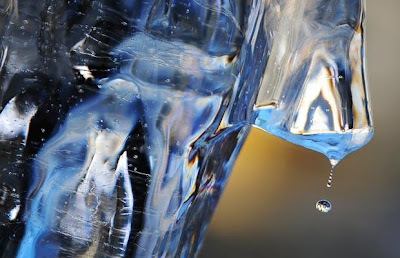 "It's real concern about climate change impacts like the threat to our water supply that is driving China and India to pursue a low-carbon development path that balances development and environmental protection," said Greenpeace India Climate and Energy Manager Vinuta Gopal. "If the developed world doesn't take the opportunity to support developing countries to both adapt to and mitigate climate change, then that balance won't hold and we will suffer an environmental catastrophe."